Adjust the oven rack in the middle position and heat oven to 500 degrees. Wrap in envelope bottom brick or heavy Dutch oven with foil. Gently press the center of the chicken with the heel of your hand to flatten, then season with salt and pepper. Heat 3 tablespoons oil in a large skillet over medium-high heat until smoking. And the chicken skin side down, then place weight on top and allow the chicken to brown, 3-5 minutes. Transfer skillet weighing oven and roast for 12 minutes. Meanwhile, combine the lemon zest, lemon juice, lemon pulp, olives, almonds, garlic and remaining oil in a medium bowl and stir. Season with salt and pepper. 4. Remove the weight, turn chicken and roast for 10 minutes until the temperature reaches 160 degrees in the breast and thigh temperature reaches 170 degrees. Transfer to cutting board. Toss arugula with ¼ cup of liquid taste and season with salt and pepper. 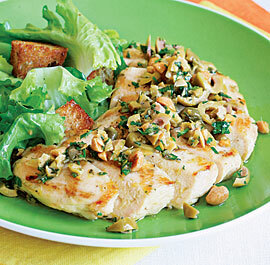 Serve with chicken and olive sauce.